The St. George Community Development Corporation with ClaimAid and St. George School will host two health insurance enrollment assistance programs in 2018. The first will held November 29 at the St. George School in the Art Room from 5 pm until 7 pm. The second will be held on December 5th in the same location and at the same time. 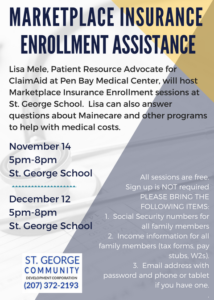 Lisa Mele, Patient Resource Advocate for ClaimAid at Pen Bay Medical Center, will host the Marketplace Insurance enrollment sessions. Lisa also answers questions about Mainecare and other programs to help with medical costs. All sessions are free and open to the entire St. George Community. Attendees should bring: (1) Social Security Numbers for all household members; (2) Income information for all working household members; (3) Email address (know your password, please! ); (4) If you have a personal computer or mobile device you are welcome to bring it for enrollment. Computers will be available from the St. George School for use as well. 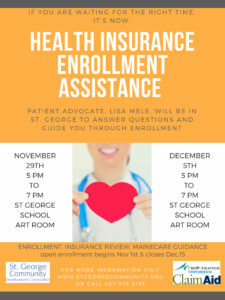 The St. George Community Development Corporation with ClaimAid and St. George School hosted two health insurance enrollment assistance programs in 2017. The first was held November 14, 2017, at the St. George School in the Art Room from 5 pm until 8 pm. The second was held December 12th in the same location and at the same time. Lisa Mele, Patient Resource Advocate for ClaimAid at Pen Bay Medical Center, hosted the Marketplace insurance enrollment sessions. Lisa also answered questions about Mainecare and other programs to help with medical costs. All sessions were free and open to the entire St. George Community. There was no registration required for these enrollment programs which had us a little on the edge of our seats. Would anyone come? Did we get the word out enough? The first session we had about 5 St. George Residents attend the open enrollment assistance program. During the second session (closer to the deadline for enrollment) we had 10 people. Success! That means that 15 St. George residents got their questions answered AND enrolled for health insurance coverage through the marketplace. Having experienced guidance from the Claim Aid representative, having a great internet connection (and computers) available and having the peer support really makes a difference when tackling getting health insurance for oneself or one’s family. The St. George Community Development Corporation plans to host this event again next year.